I love this show! What a funny dog! 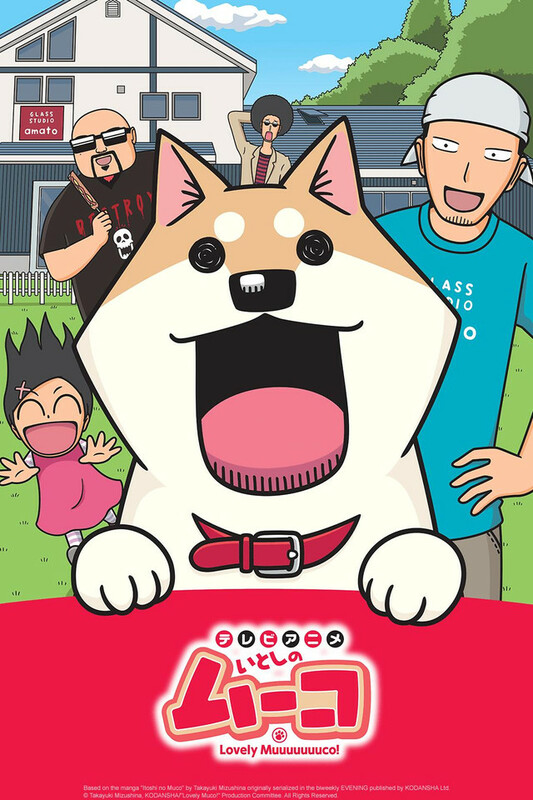 I can see why people wouldn't like this, but if you have a dog you're in love with like Muco's owner loves her than I think you'll love this show. There's no major plot points, it's just 12 min. of fun. I watched it with my lil pug, and she seemed to enjoy it. I absolutely adore Lovely Muuuuuco! If you have a dog that isn't exactly the sharpest tool in the shed, you will identify with this show 100%, and it airs on Fridays so it is a great, laugh-out-loud way to wind down after a stressful week. To those that reviewed it poorly, I don't think they understand that this is a remake of the previous iterations of Lovely Muco. That show ran shorter episodes and, yes, it did have a quirky and some would say bad animation style. I am not the creators, but I'm pretty sure that's what they were going for: a remake of Muco, but still retaining its original style. Go watch the previous version on Youtube, you'll see the old art style and if you really hate it that bad, you'll have only wasted 3 minutes of your life instead of the 12 minutes of these new episodes. This show is great to watch if you're looking for a cute lighthearted show. Muco really is a lovely dog and if you love dogs you'll love this show. This series offers an iside look at what the Akita, Muco, does through an average day with her owner. Her adventures range from car rides to chewing on her towel and of loving her owner. It's a really cute series and i highly recommend it. Enjoyable, Colorful and All Around Fun - Lovely Muco! This is a hard show for people to not enjoy. The diversity of the humor in this show is absolutely fantastic. Slapstick, gags, puns, observational, double meanings, wordplay and numerous other types of humor are present here and strong in their delivery in what is easily one of the best all ages anime series I have ever seen. Adults will laugh at the more complex observational and subtext driven jokes with kids getting a kick out of Muco's antics and simplistic ways of thinking/observations, offering a very likable and sometimes relate-able character for them. Honestly, unless you're an extremely uptight 'NoFunAllowed' type of person, you'll struggle to not find something to like with this. For animation enthusiasts, the CG style will take some getting used to as it is clear at times when more work is put into frame fluidity and stabilization from one scene to the next. Late in cour 1 and for most of cour 2 so far, it's improved significantly and the disparity between animation quality isn't as present, in addition to a general exposure to the animation adjusting you to tolerate the non-traditional animation style. This is how you do GREAT humor while appealing to as many audiences as possible without diminishing the QUALITY of the humor. The author and staff of this show have something that is pure genius on their hands, providing some genuine laugh out loud moments from this viewer that I haven't experienced in years fro an anime series. The well of jokes may run out eventually but for now, the refreshing nature of Lovely Muco! is something that makes it a highlight of the Fall 2015/Winter 2016 season. An absolute must watch for people wanting to be truly entertained. Not everything has to be Studio Ghibli. Take a look at the UPA cartoons of the late 40's and into the 50's to see what can be done in a sparse style. Very charming, Yes, Muco has a crush on her master. Don't make more of this than is really there. At first i thought the animation was quite poor and i didn't like... but hey, you just have to give it an opportunity and you will enjoy it. It's short and fun, nothing else, nothing less. Simple anime for people who just want to laugh about silly, pure and cute things. This serie is so pure that just seeing Muco's innocence, how she can be this happy with so simple things... just makes you happy too. If you have pet/s (and if it is a dog much better) you'll feel kinda identified with Komatsu-san, we love our pets and i'm sure that at least once, you've wondered what does your pet thinks? Do you like dogs? Do you like humor that isn't actual humor? Are you alive? Do you like shows with a plot that isn't a plot? Is your binomial nomenclature homo sapiens? If you answered yes to any of these questions, you'll love Lovely Muco! some people may say "Meh, it's not anime because of the art style," but to those people I say to research the literal definition of anime and remember that on air, being unique is a good thing - just look at the yellow-skinned Simpsons! My only complaint is that this show sets up a lot of spots where a quick pun would be glorious, but many of these opportunities are never exploited. Still, even without the dry humor this is a fantastic show, and I'd recommend it to anyone. The cutest anime that you will ever watch!!! This anime is perfect for anybody who has a lovable pet. It is also perfect for anybody who wants to watch an anime that is cute and will make you laugh. I like it because the characters are so lovable and every episode makes me laugh. I hope that this series never ends. even though the animation is a little cheap it is short and sweet, it gets comedy done right. If you love cuteness and dogs you'll love this. maybe let your pet watch this and see what s/he thinks.